What was I saying about 2016 being a little bit busy? Late in the summer, I found myself exploring the Eifel region of Germany from behind the wheel of a BMW M2 and a Seat Leon Cupra, after an invite from our friends at KW Suspension. 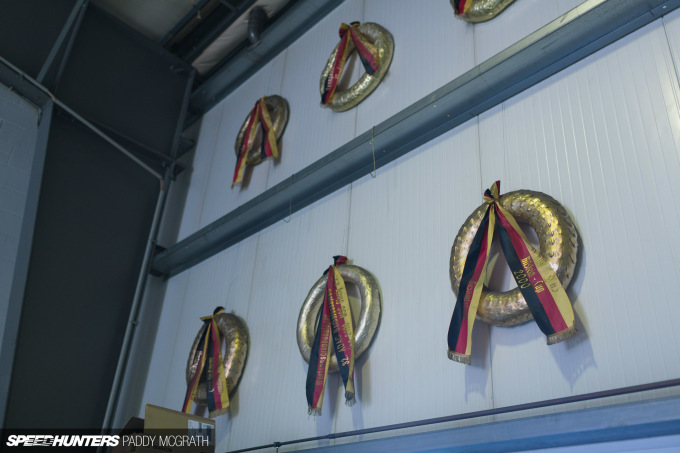 Despite the Nürburgring’s massive size, it’s also home to a very tight community of motorsport-involved individuals. 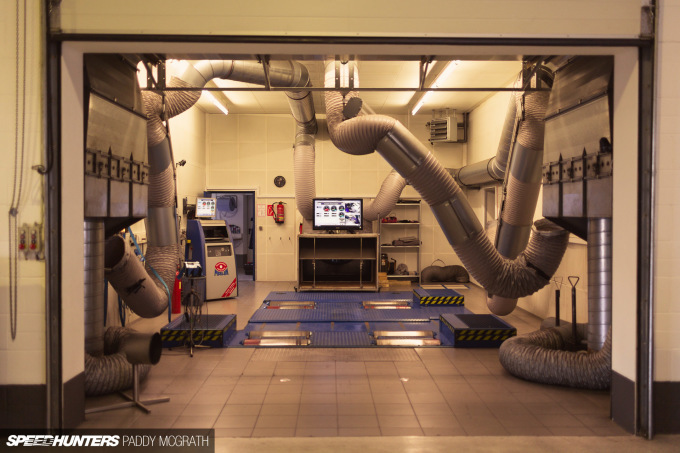 There’s a lot of secrecy with so many cars and projects being developed at the Nordschleife, but there’s a great amount of mutual respect about too. 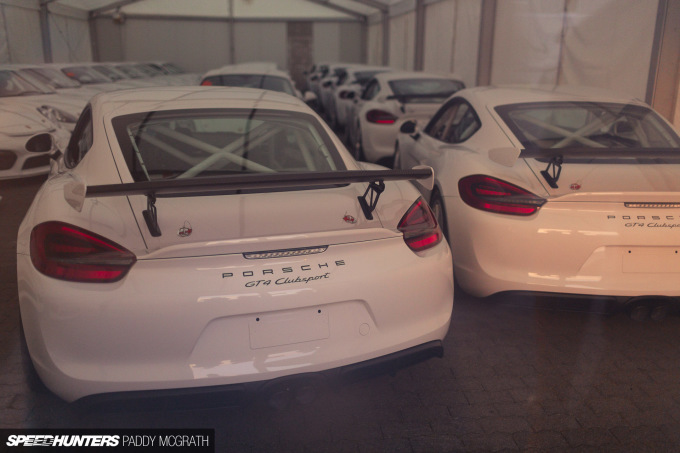 Manthey-Racing should be a familiar name to those of you who regularly read Speedhunters. 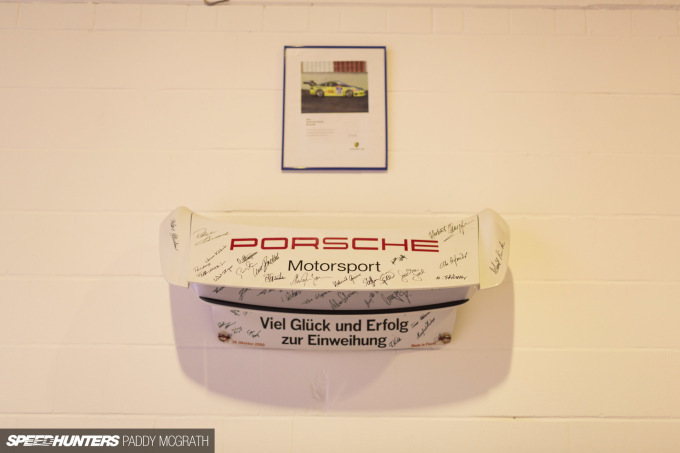 Based quite literally across the road from the entrance to the Nordschleife, the race team have become synonymous with both success and Porsche at the ‘Ring. So much so in fact, that Porsche AG now owns a majority stake in Manthey-Racing, trusting Nicolas and Martin Raeder’s outfit with its factory cars in both 24-hour races at the Nürburgring and Le Mans, as well as in the WEC. 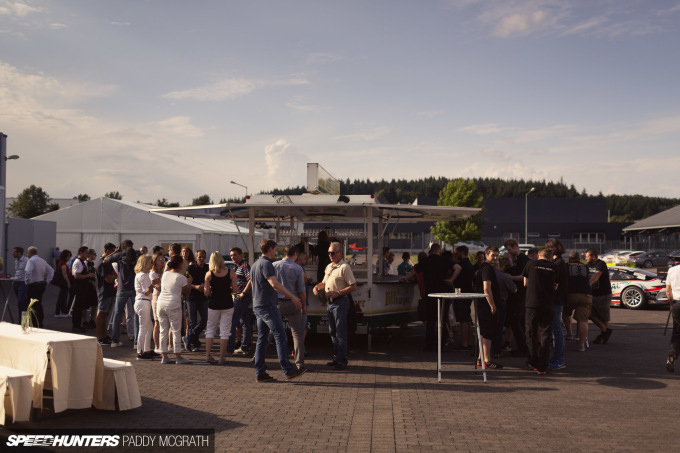 Any time I’ve ever visited Manthey-Racing in the past it’s been during a 24-hour race, and while the crew was certainly busy with a round of the World Endurance Championship at the Nürburgring on this particular weekend, they still found the time to host their annual BBQ at their headquarters. 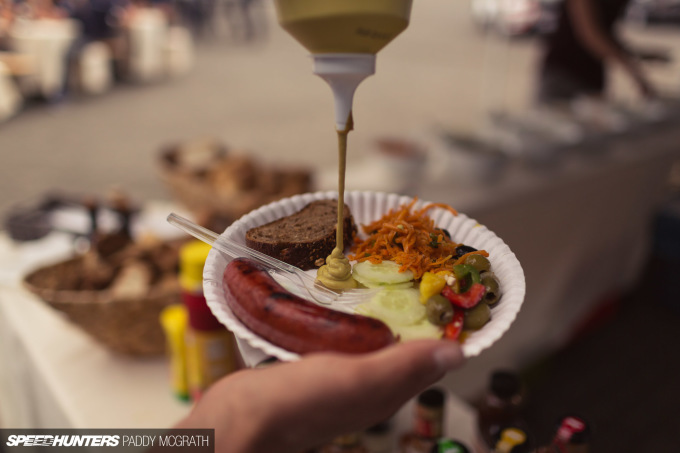 The idea behind the BBQ is quite simple: to show appreciation to the men, women and their families who make the racing happen. 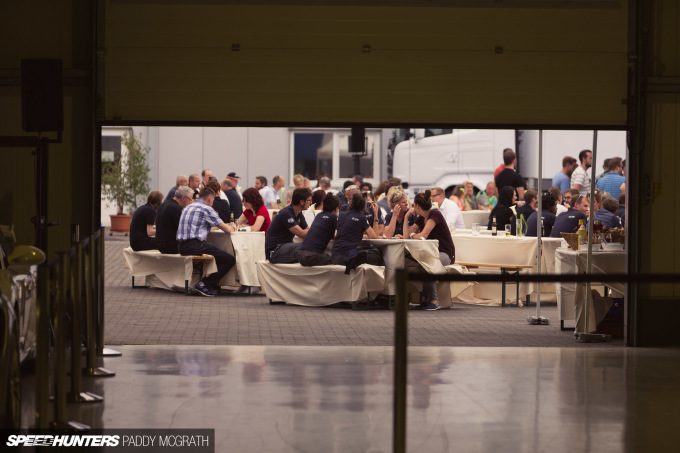 It’s not just about anyone related to Porsche, all the teams are invited. 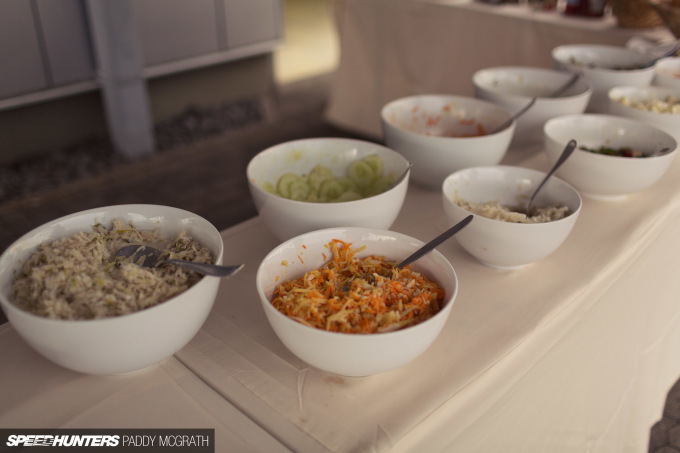 In such a cut-throat industry, it’s a really nice occasion. It’s also a great opportunity to check out a range of race cars in a rare, relaxed environment. I hopefully feel that I’m not alone in saying this, but it’s quite difficult to differentiate between the various Porsche race cars, the 911s in particular. 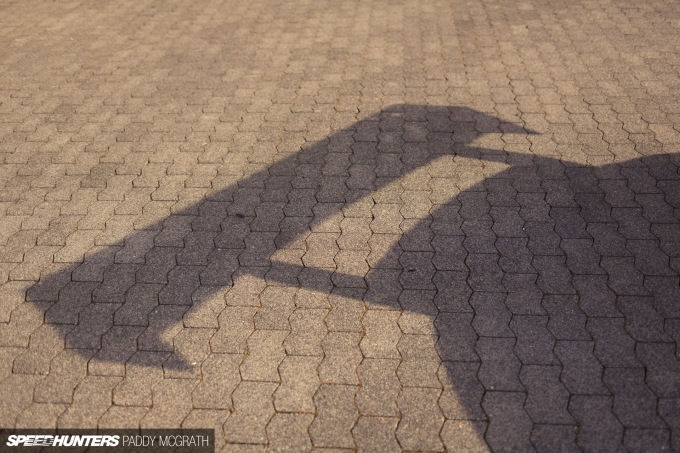 The differences are often so subtle that the casual observer would be forgiven for mistaking one for another. 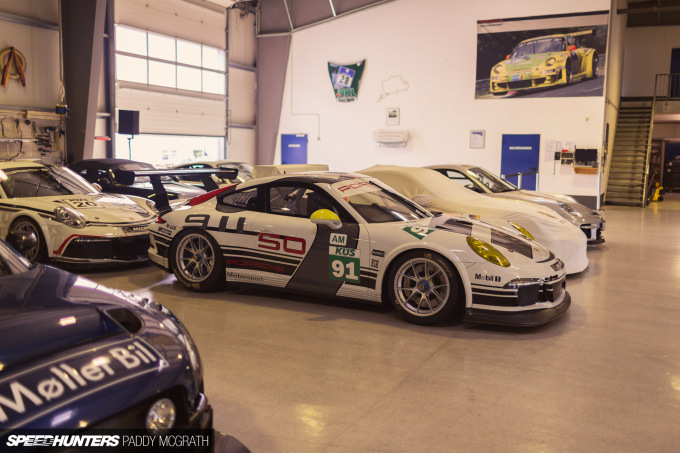 In the 911 range alone, there’s the RSR, GT3 R, GT3 Cup and GT3 Cup MR. 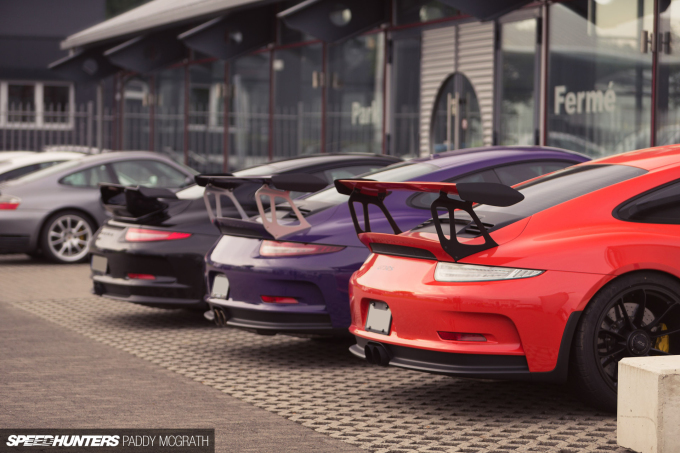 They might all be 911s, but they’re certainly not all equal as I would find out. 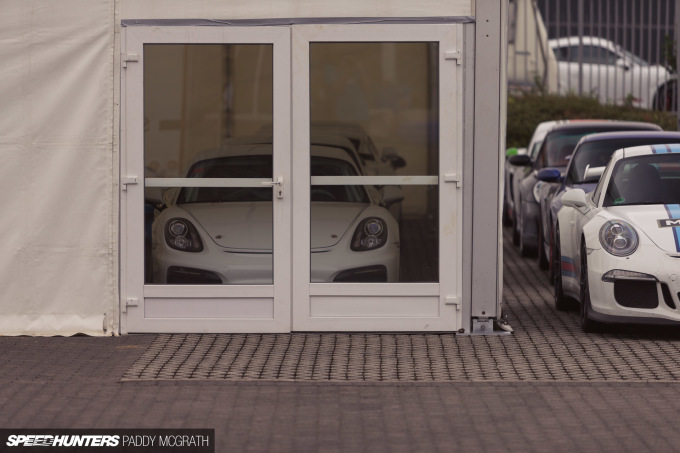 I haven’t even mentioned the Cayman. While the street cars are considerably easier to identify, to a point, the race cars are a whole other proposition. The 911 RSR is probably the least difficult to pick; the Le Mans 24 Hour and WEC competitor is the one most often in the limelight as the pinnacle of the 911 race car. 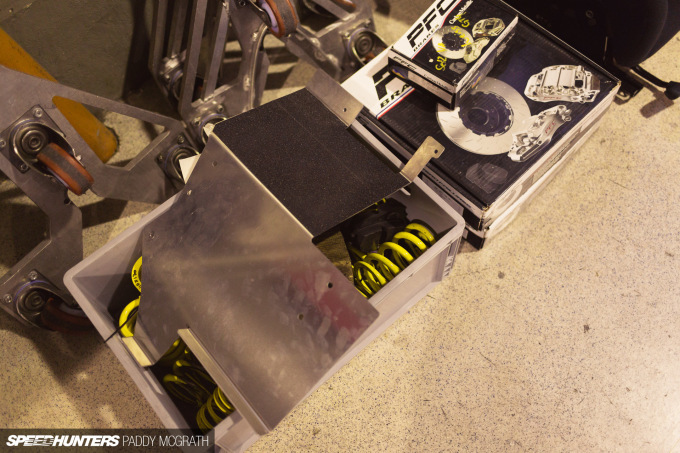 Because of the WEC event, there weren’t any RSRs about during the BBQ, or at least none on public display. I guess you can’t share everything when rival teams are about. Directly below the RSR is the GT3 R and there was one of those on display. 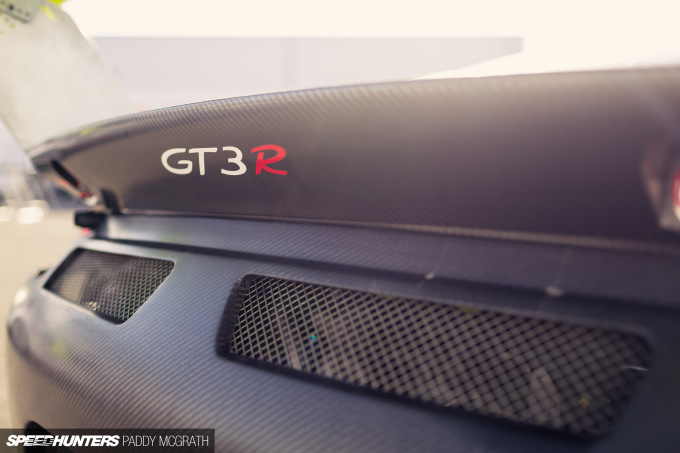 Based upon the GT3 RS street car, the GT3 R is homologated to FIA GT3 specification. 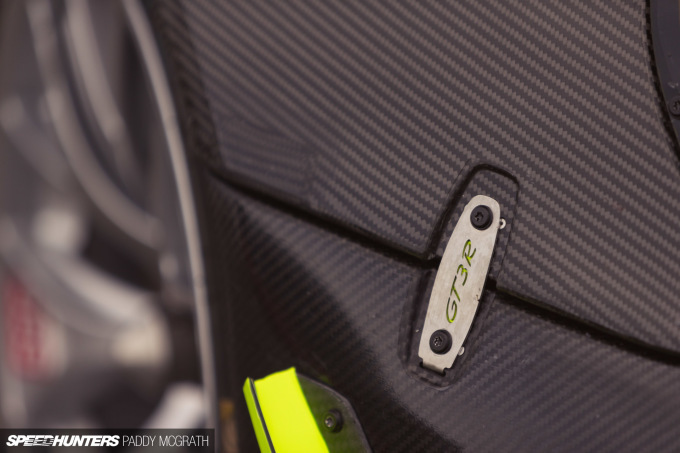 Weighing in at 1220kgs – depending on ‘Balance of Performance’ regulations – with around 500hp from a 4.0-litre flat six, the GT3 R is pretty much all the race car you would ever need. 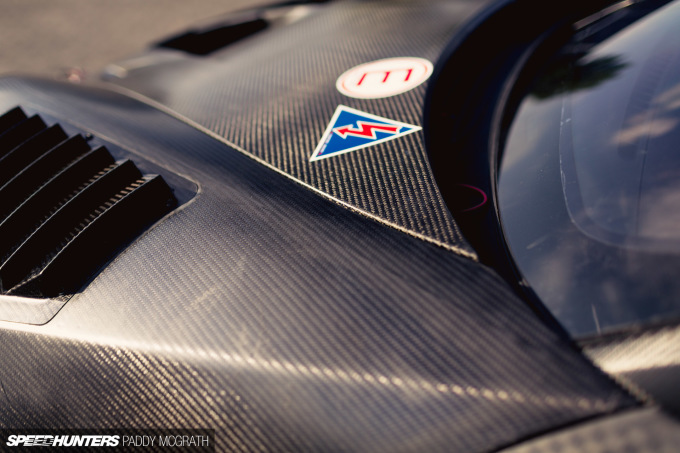 There’s significant aero too, which requires a certain amount of bravery to exploit fully. It’s not really for the feint-hearted. 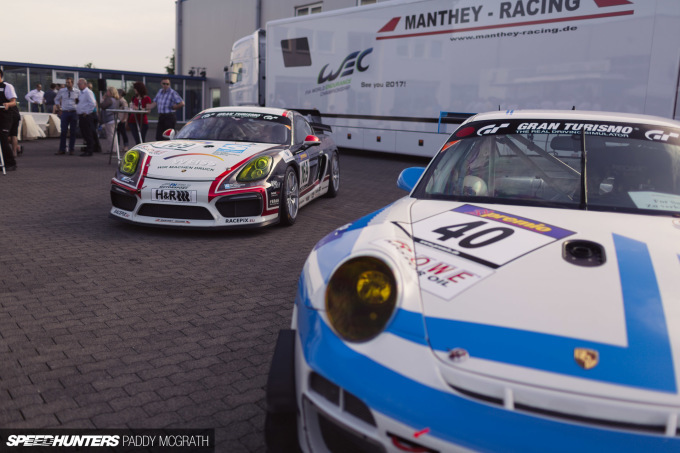 At the opposite end of the scale, the GT3 Cup car is the one you might be more familiar with; the same car features in the various Carrera Cup series’ around the world. 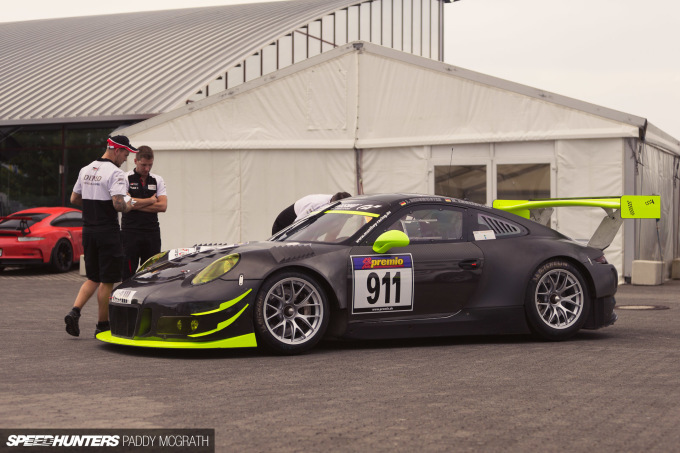 The GT3 Cup is the entry-level 911 race car, based upon the GT3 road car. 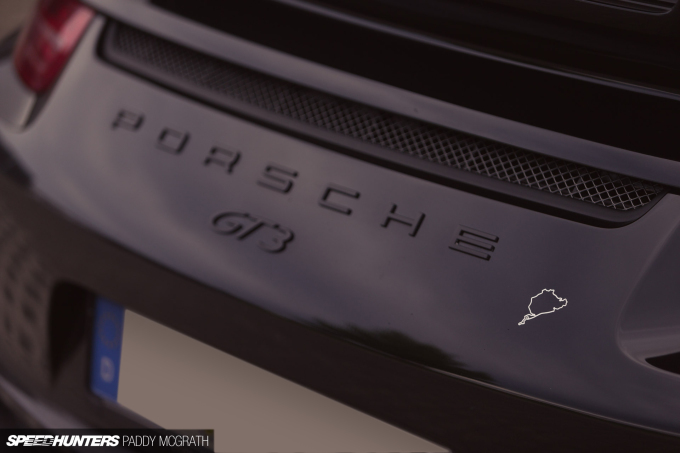 It’s the most forgiving of Porsche’s race car offerings too, but I wouldn’t consider it tame by any means. It’s a little lighter than the GT3 R, although it’s down around 40hp from a smaller 3.8-litre engine. The aerodynamics are considerably less than the GT3 R, but in turn, that lends itself to being a little bit easier to get the most out of it. 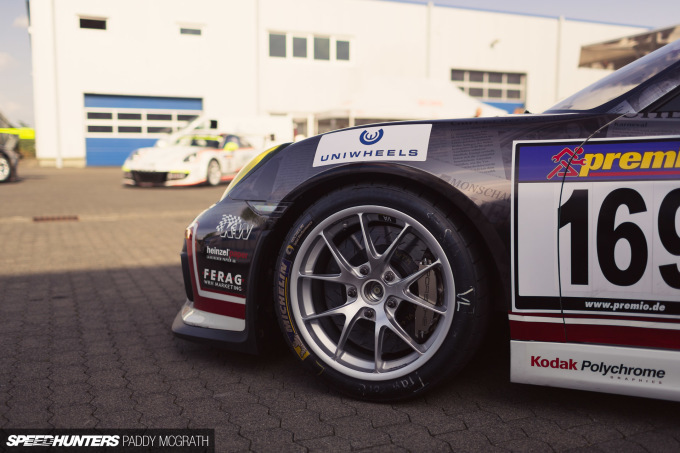 The really interesting one, at least in my books, is the GT3 Cup MR. Okay, the name is a bit of a mouthful, but it takes the best of both the GT3 R and GT3 Cup and melts them into one pretty awesome race car. 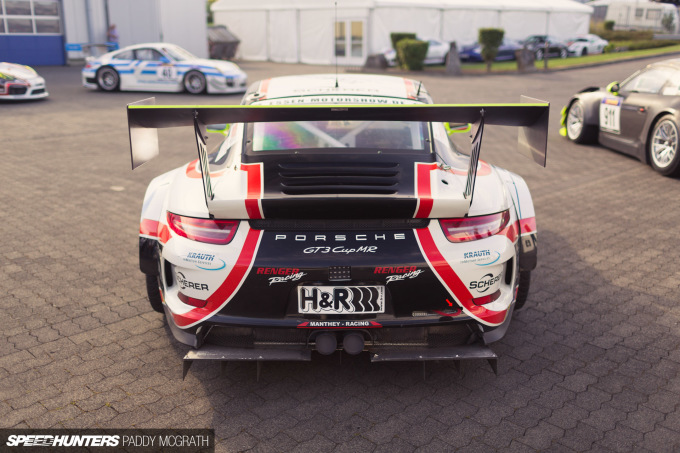 The ‘MR’ in GT3 Cup MR, stands for Manthey-Racing, if that wasn’t obvious. Technically, the GT3 Cup MR is a conversion package rather than its own car in the Porsche racing line-up, and there’s a good reason for this too. Outside of their WEC programme with Porsche, Manthey continue to be heavily involved in the VLN Endurance Series at the Nürburgring. 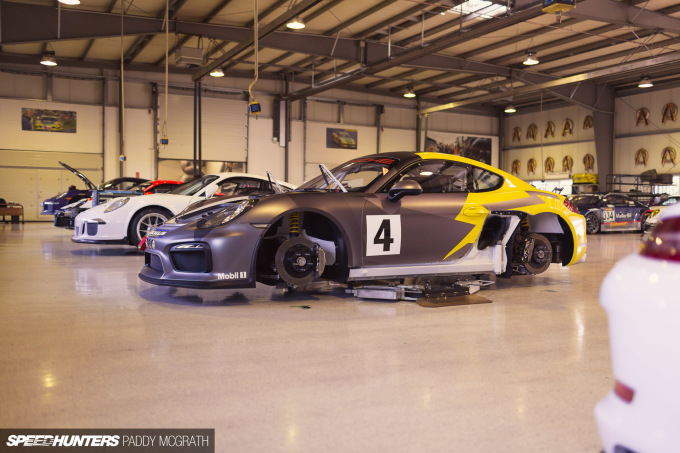 The idea was simple: creating a car based on the 991 GT3 Cup which could compete with the GT3 R in the SP7 class (vehicles 4.0-litres and under), but was able to be run on a budget closer to that of a GT3 Cup car. 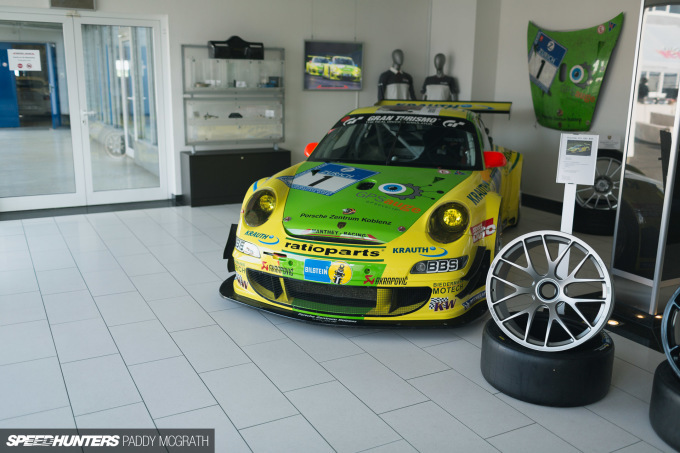 Starting with a GT3 Cup, Manthey-Racing use a GT3 R style front end, fenders, hood, lights, suspension and wheels. There’s also an ABS system, a wider rear axle, a central front water-cooler, front skid plates, an aerodynamicly optimised engine cover and a larger rear wing. 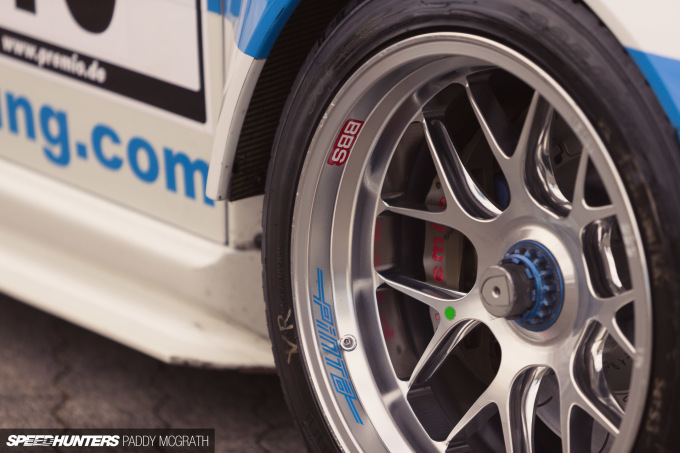 The water-cooler is an interesting aspect of the build, as it has been converted from a three-piece system from behind the front bumper to a single radiator setup in the front trunk to protect it from any minor impacts during the course of a race. 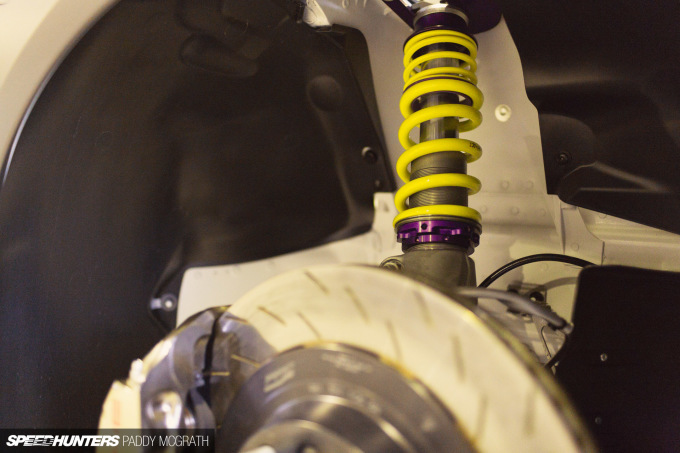 The cars are also converted over to KW’s 3-way adjustable Competition suspension. With this setup the MR leans more towards the GT3 R in terms of mechanical grip; it runs the same size slick tyres as that car too. 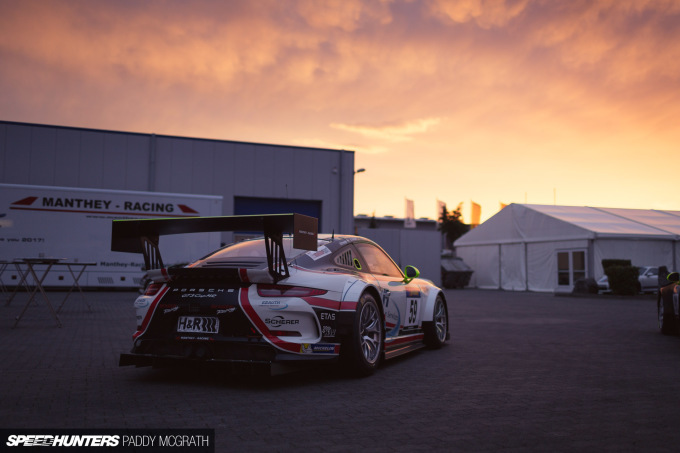 Within the first season of running the GT3 Cup MR alongside two factory GT3 Rs and and two customer GT3 Rs, Manthey-Racing were able to determine that the split times between the professional drivers and the gentleman racers in the same car were smallest with the GT3 Cup MR. 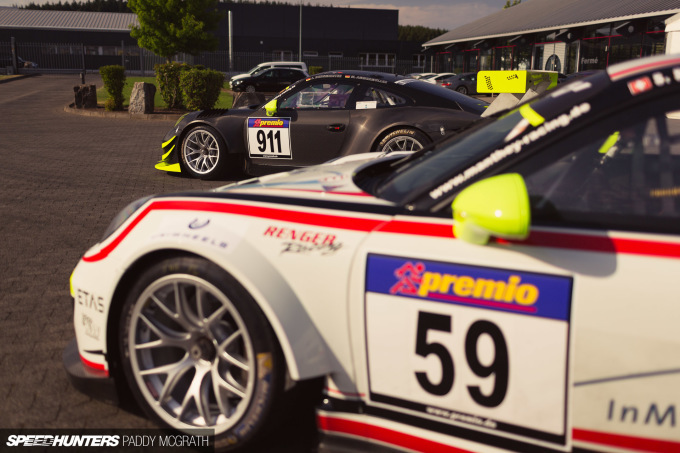 Even when compared to the GT3 Cup, the GT3 Cup MR retained the smallest time differential between both sets of drivers. 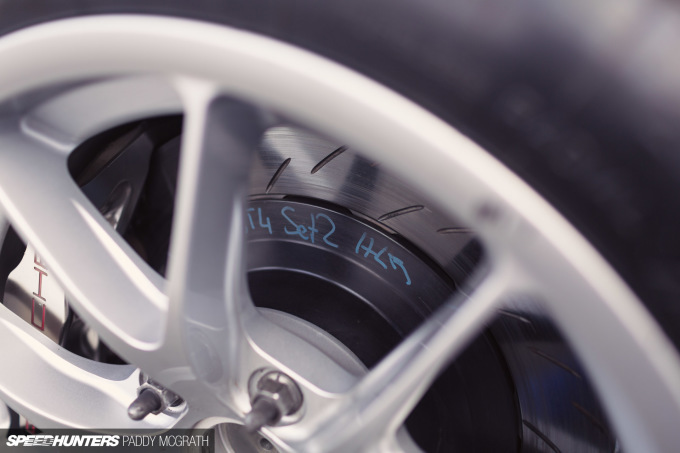 This is down to the GT3 Cup can be tricky to drive at the limit, whilst the gentleman racers can struggle with getting the most from the aerodynamic package on the GT3 R.
What does it all mean with regards to lap times? Manthey-Racing expect a GT3 R to lap the Nordschleife in around 8m00s, the GT3 Cup MR in 8m15s and the GT3 Cup in 8m25s. 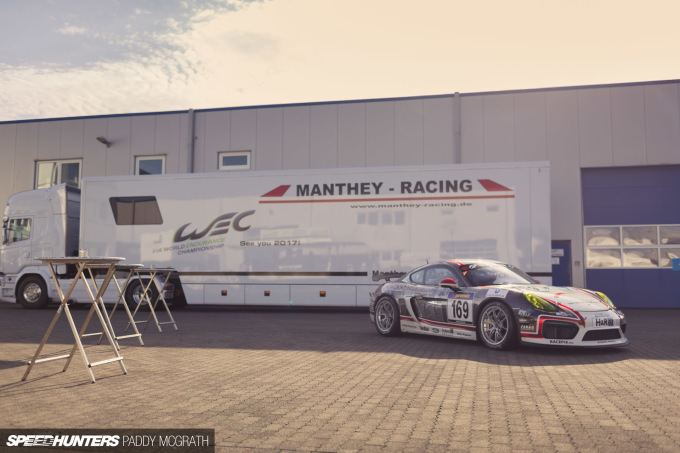 It’s a similar philosophy to the GT3 Cup MR, where Manthey-Racing have taken the entry-level race car and stepped it up a couple of notches. 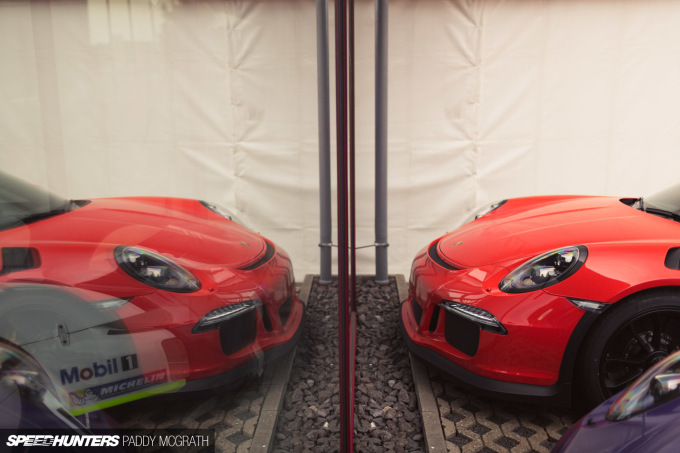 In this case, they’ve actually gone as far as getting the car homologated to GT4 specification. The requirements for such homologation include mostly improved safety features, an upgraded fuel cell with a safety cut-off valve, upgraded extinguisher system, refuelling system, safety net, seat and air jacks. There are performance increases too, largely KW 2-way adjustable Competition suspension with an improved rear wing and some weight reduction with a polycarbonate windscreen and carbon fibre doors and frunk. Having had my fill of free food and enough new 911 information that it was almost literally pouring out of my ear holes, I took the time to just sit down and watch the sun set over Manthey’s courtyard. 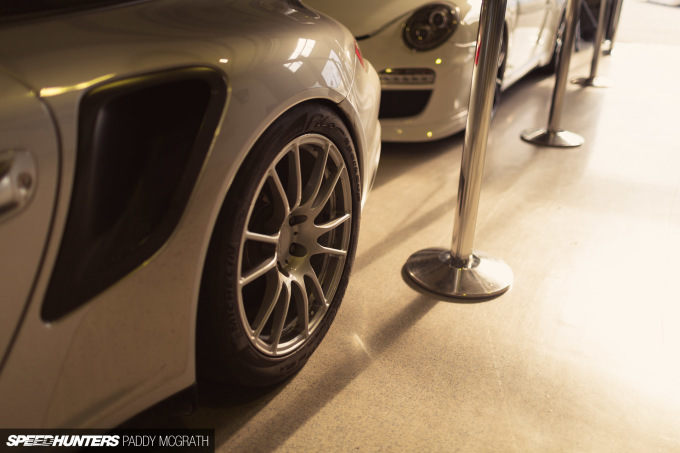 The event had clashed this year with the annual driver’s dinner, so it was a little bit quieter than it should have been, but in some ways I appreciated the relaxed atmosphere to be able to take in these cars in such detail. 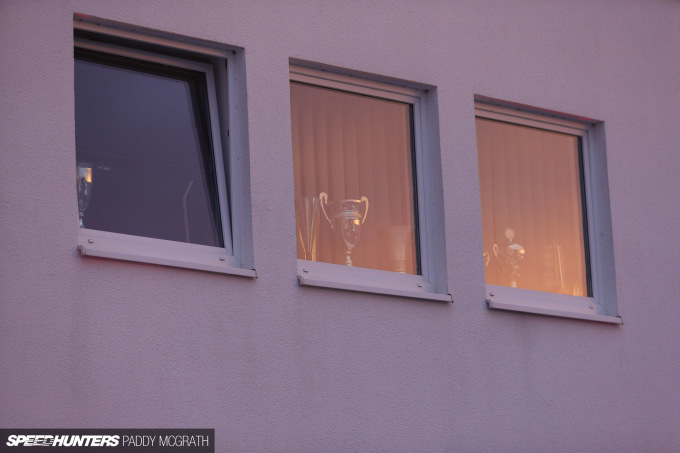 As you can hopefully now see, there’s always a little bit more than meets the eye. 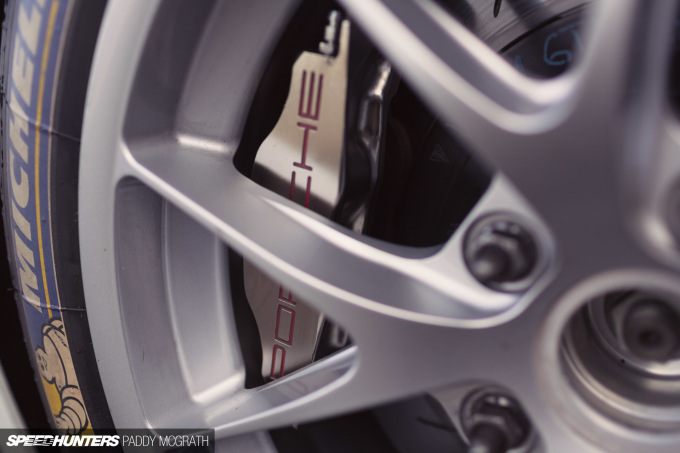 Gallery: 918, LaFerrari and P1, Plus F40 and F50!